Recommended to: Fans of psychological stories with an in depth look at a killer's mind. Everyone who lives at 23 Beulah Grove has a secret. If they didn’t, they wouldn’t be renting rooms in a dodgy old building for cash—no credit check, no lease. It’s the kind of place you end up when you you’ve run out of other options. The six residents mostly keep to themselves, but one unbearably hot summer night, a terrible accident pushes them into an uneasy alliance. What they don’t know is that one of them is a killer. He’s already chosen his next victim, and he’ll do anything to protect his secret. Wow. That is all I can come up with at the moment. 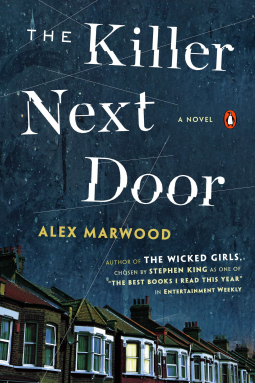 The Killer Next Door is not what I expected, but I thoroughly enjoyed it. I wouldn't necessarily categorize this as a thriller but I don't know what other genre would be appropriate given the nature of the book. There weren't a lot of surprises or tension that I would expect, but the story was beautifully crafted. Each member of this group jumps off of the page. This cast of characters becomes friends through a series of unfortunate events. We see the world from all of their perspectives and Marwood transitions between them seamlessly. This book is definitely plot driven with each of the six characters having their own story to tell. While the killer is revealed early on, it did not detract from the mystery of his character. We are taken to unexpected places as he describes what goes through his mind. The details made my skin crawl, but I couldn't stop reading. The depth of craziness built into the Lover comes across very strong, but you almost feel sorry for him. The ending was not really a surprise, but it was satisfying. All in all I highly recommend this if you have any interest in a killer's point of view. The rest of the characters are equally well written with deep backgrounds and secrets of their own, making this novel one that will appreciated for years to come.